Modified version of the Australian built Ford Interceptor. Only 1 screen used Interceptor exists from the original movie series. With only about 8 replicas in the US, they too are almost just as rare to see. 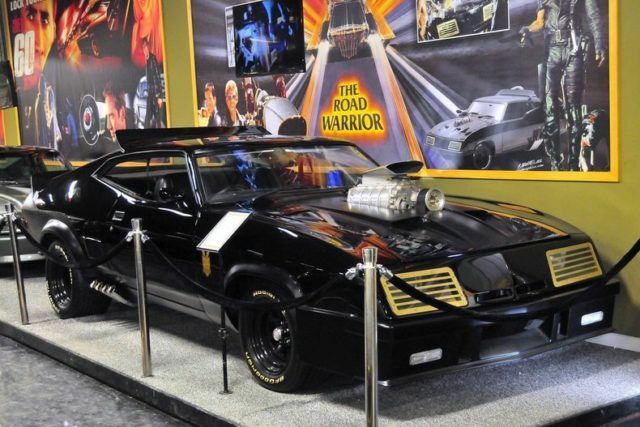 This fan built Mad Max car was painstakingly duplicated, over $110k in receipts! Every authentic detail was replicated from the overhead radio to the picture of Maxs wife and child on the steering wheel. Even the engine was replicated the same as the movie car with a fake blower that would spin by electric motor with a button located on the shifter. The restoration was no expense spared. The paint is arrow straight with a reflective mirror finish. All new interior from the headliner to the carpet. All the mechanics were rebuilt and the car performs just as good as it looks. Everything works from the gauges to the horn. There are even lights in the prop overhead radio that light up. The restoration was documented with receipts and photos. The Volo Auto Museum imported this car into the United States, all duties and taxes have been paid and it has a clean title so the car can be registered and driven in the US.